Mobile stages are the main products of LUMEX. Are designed for the entertainment industry. They are the ideal solution for organizing and conducting outdoor public events, from small meetings to large concerts. 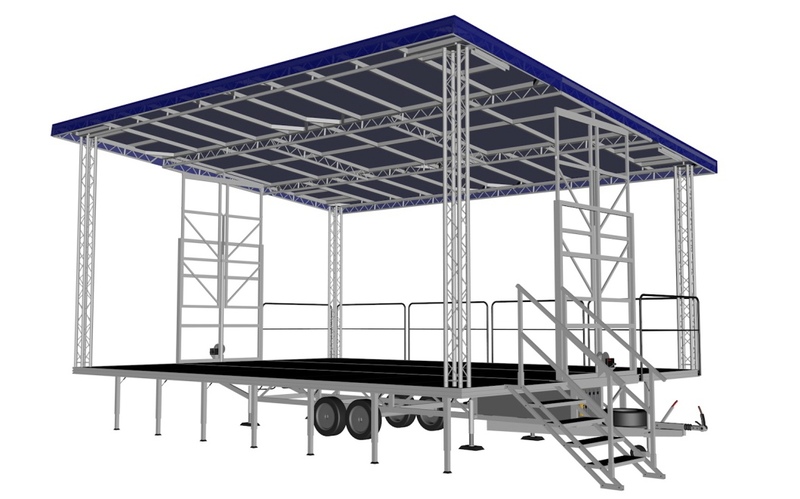 The biggest advantage od Mobile Stages is short time of assembly and the submissiond, which, depending on stage size is 30 to 60 minutes. To handle Mobile Stages are enough two people. Due to its mobility and ease of use, can be used in several different places, even in one day. Each version is available in several sizes, which will facilitate choice for your needs. 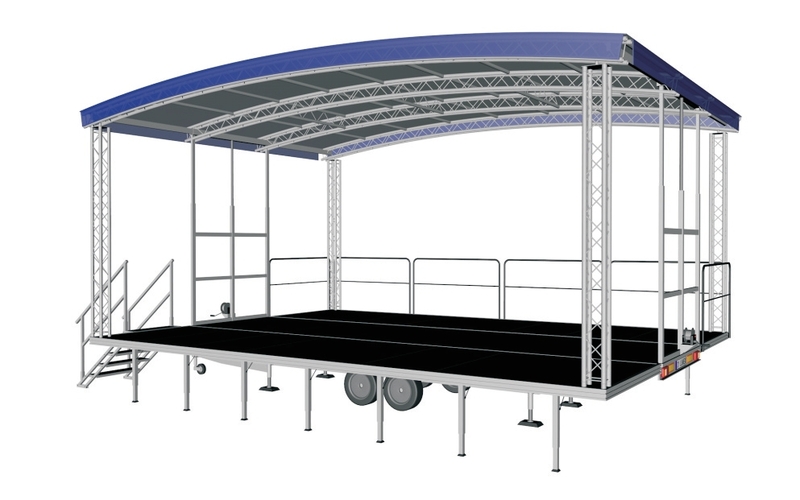 In addition to any type of Mobile Stages we offer a wide range of accessories that can increase its functionality. The Mobile Stage is built on a steel frame supported on two axes. Chassis is fully galvanized. Four pillars are standard equipment, are used to assembly and level the stage. The stage platform consists of three parts, one fixed directly to the frame and two folding. The whole is covered with an approved non-slip waterproof plywood. The roof of the trailer shall consist of three sections, one with vertical slide and two folding, the sides are made of aluminum profiles. The whole is covered with an approved PVC canopy. The side panels can be made of canpoy or scrim. The roof is lifted by manual or electric hydraulic pump or wire rope hoists. 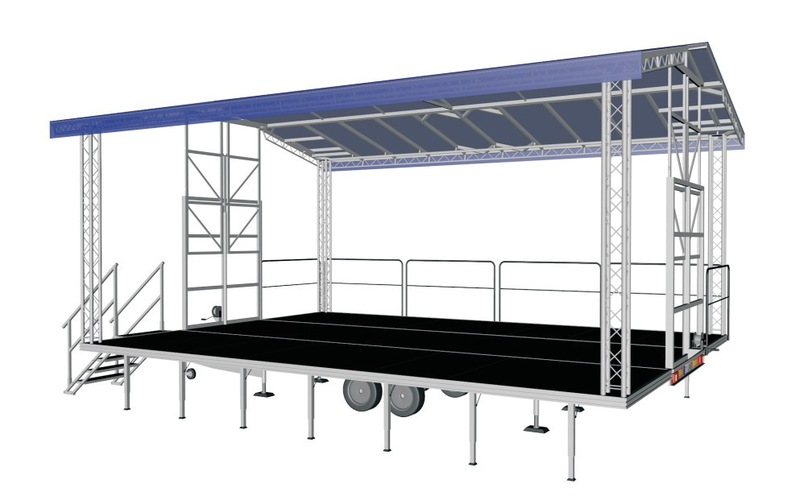 Using the unique LUMEX solution allows at the same time lifting the roof with folding roof wings, which greatly reduces the time to prepare Mobile Stages for use. The standard equipment of each Mobile stages are stairs with handrails, protective side barriers to the back and sides, technical documentation and user's manual, official certification of complete vehical type, spare wheel, fire extinguisher, first aid kit, helmet, tool box. We also guarantee free training and demonstration for individuals who will handle the Mobile Stage.